‘Batavian Athens’, that is the term the humanists used to designate the town of Leiden because of the university housed within its walls. These words also embellish the title-page of the book that Johannes Meursius (1579-1639) published in 1625 to advertise Leiden and its academy, in Latin of course. Athenae Batavae presents a gallery of academic icons: the engraved portraits of the Leiden professors are combined with succinct biographies. The book also contains one of the oldest images of the Academy Building. This former church of Dominican nuns at Rapenburg has been in use as the university’s centre ever since 1581. 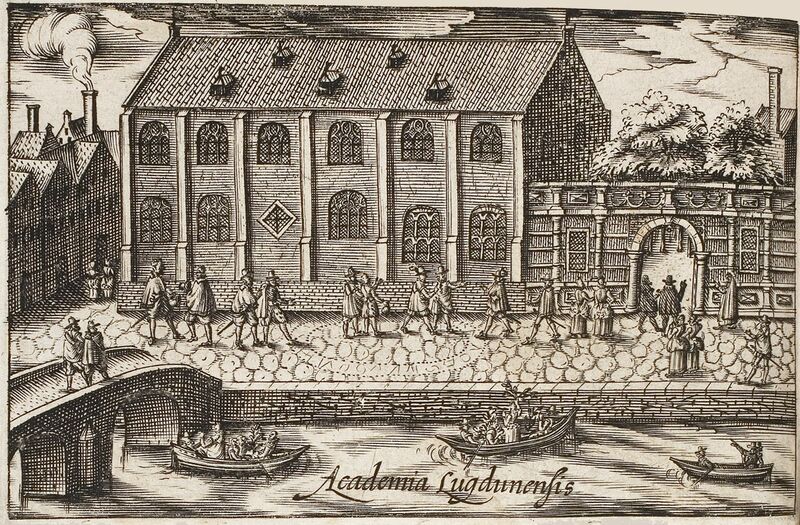 The engraving shows the building with the new academy gate (built in 1613 but demolished in the nineteenth century). The anonymous artist depicted the building using six bays instead of the actual eight. Sloppiness or a consequence of his composition? On the ground floor, behind the two windows at the far right, is the Vaulted Room, just like today. It was here on October 31, 1587, four and a quarter centuries ago, that the university created its first library room. It follows from payments noted in the diary of Jan van Hout, secretary to the curators, that in the spring of 1587 a lot of carpentry was done “aen de nieuwe librarie” (‘on the new library’), and that later in the same year 57 books and manuscripts were purchased from professor of Greek Bonaventura Vulcanius. These “Vulcanii boucken” (‘books of Vulcanius’) were placed in the library room, next to the eight-volume Polyglot Bible donated by William of Orange in 1575, and the theological books from the bequest of professor Johannes Holmannus, who had died in December 1586. Eight years later, in 1595, the collection of books was moved from the Academy Building to the first floor of the Beguinage Chapel on the other side of Rapenburg. The library remained at this location for almost four centuries. As a consequence of the steady influx of books the building underwent many alterations until, in 1983, the university library moved to a new residence at Witte Singel. Meanwhile, in several other locations faculty libraries had been created. In 2010, after a combination of forces, the present organisation was established, Leiden University Libraries, with six locations, over 4 million volumes, 1 million e-books, and access to 600 million digital articles ‘in the cloud’.